I jokingly say my daughters turn into fish when school lets out for the summer. We spend most of our free time swimming and relaxing in a pool, usually at my parents&apos; house. However, sometimes we want more amenities and venture to aquatic centers. I mentioned to my daughters that the Gill Family Aquatic Center offers a lazy river, waterslides and many other fun features. Of course, they happily agreed to check it out, even though we just spent most of Memorial Day weekend swimming with family. We packed up our swim gear and headed to Danville. Located within Ellis Park and just off Main St./U.S. 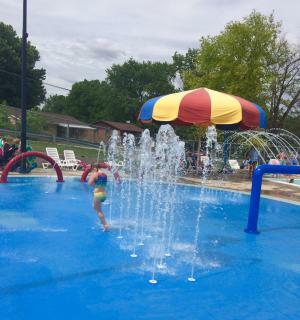 36, we easily found the Gill Family Aquatic Center, 450 Leedy St.
A fellow blogger described this Hendricks County aquatic center as, "a community pool with a kick." After spending a delightful family day and not once hearing, "I&apos;m bored," I&apos;d say that is a very accurate description. Gill offers all the amenities a larger center does but on a smaller scale. Kids of all ages and adults can enjoy various aquatic features but with a smaller price tag and fewer crowds than a bigger facility. Gill offers two 120-foot waterslides. One boasts an enclosed tube, and the other is completely open. My 8-year-old insisted I slide down the enclosed slide before her. Despite my nervousness, I took the plunge and loved every minute of it! It&apos;s only completely dark for a few seconds, which is perfect for kids and wimpy adults like myself. We took advantage of the short lines and continued to have a ball riding both slides. Kids must be at least 48 inches tall to ride on either slide. My 5-year-old was hopeful, but the lifeguard measured her and she came up an inch short. I&apos;m not completely convinced she would have ridden them as it seems a bit daunting for children under 6. This area seems to be most popular for older kids and teens who like to show off their diving/flipping skills. But keep in mind the water below the diving board is 12 feet. As long as your child is comfortable going into deep water and can swim to the ladder, then this is an entertaining activity for most ages. My 8-year-old though was one of the youngest in line. 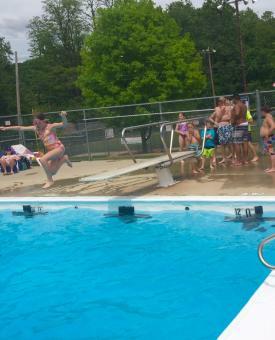 Near the diving board, a shallower area of 4-5 feet provided another perfect place for some of the older kids and teens to play and congregate as well. When asked about her favorite activity of the day, my youngest daughter replied, "the lazy river, of course". It&apos;s so relaxing to just let the water push you in the right direction. No rafts needed with this river as the strong current carries you around. People of all ages enjoy this amenity. For safety reasons, stay close to the little ones. Within the lazy river, an optional pool vortex propels you in a constant circle. I saw lots of smiles from toddlers and pre-schoolers as they played on and around this water feature. The small slide was certainly a hit along with the various attachments continually spraying water. The zero depth entry allows for a smooth transition into the play feature area. Various water fountains and sprayers are featured on this splash pad. Babies and toddlers love this safe area to have some water fun. There are no age restrictions in that area, but I didn&apos;t observe very many older kids playing in it while we were there. That is, until the life guard switch whistles blew and everyone had to exit the pool. For those who want to sunbathe/relax in the sun, lounge chairs surround the majority of the pool. Four large umbrellas are scattered throughout the center if you prefer shade. A concession stand along with picnic tables overlook the entire pool. Concessions offered include what I consider standard pool fare. The menu consists of slushies, popsicles, ice cream novelties, chips, candy and a few hot food items (pretzels, pizza, nachos, etc.). Prices are reasonable, and it&apos;s ran efficiently. As previously mentioned, entry remains cheaper than at larger aquatic centers. A daily pass costs $5 for Danville residents and $7 for non-residents. Ages 3 and under get in for free! If you really want to save a few bucks, you can purchase a twilight pass (4-7 p.m. only). Residents can enter after 4 p.m. for just $3 and non-residents pay just $3.50. Membership options are available as well. Gill Family Aquatic Center is open seven days a week,11 a.m.-7 p.m. Monday-Saturday and noon-7 p.m. on Sundays. Pool rental options are available after normal hours on Friday, Saturday and Sunday. The 2018 season ends Aug. 7. Bring the whole family out for a fun-filled water adventure! 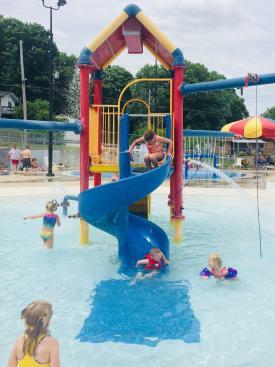 If everyone still has energy after a day of swimming and sunshine, be sure to check out the playgrounds and trails in Ellis Park. 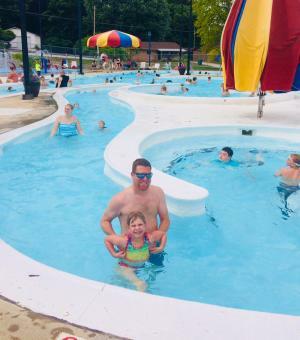 The Gill Family Aquatic Center also is only minutes from Danville&apos;s historic downtown, which is a must see in Hendricks County as well, and includes some nice restaurants such as The Mayberry Cafe.